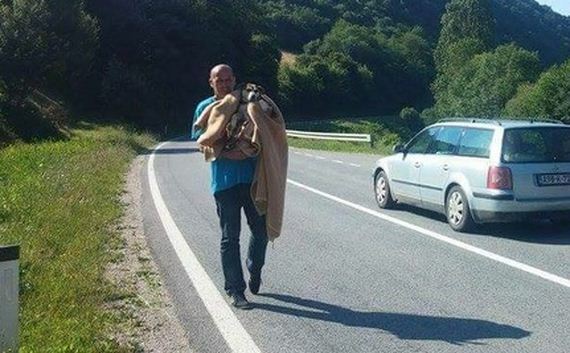 Drivers Stop Traffic To Rescue Helpless Dog, Then They Get A Huge Surprise! 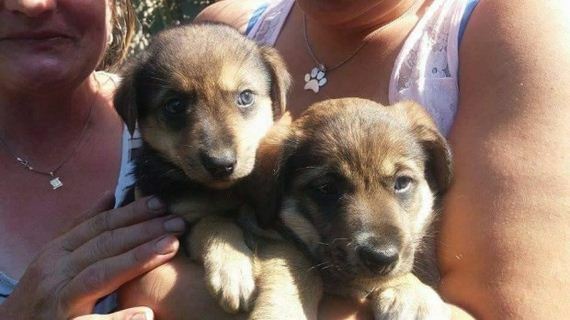 Edina and Caki are two kindhearted people that live in Sarajevo, Bosnia, who spend much of their time rescuing animals. This team will go to great lengths to ensure the safety and happiness of others, even putting themselves in danger for standing up to what is right. 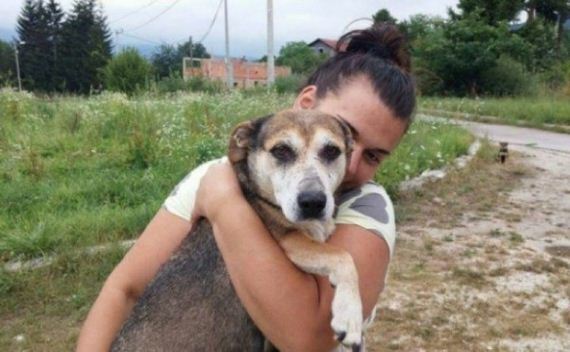 Sometimes referred to as the “Angel of Sarajevo” this woman dedicates her life to helping animals in need of loving homes. 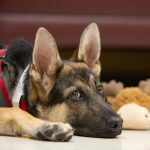 As they were driving along the highway, they noticed a helpless dog, weaving in between oncoming traffic, cars and trucks nearly colliding. Edina and Caki came to a dead stop in their car and jumped out, comforting the dog on the roadside. They both noticed that she was clearly puffy around the middle, but unable to tell if she had recently had her puppies or if she was soon expecting. So Edina and Caki decided to follow this poor dog who they thought was abandoned, covered in scars with a clear sadness in her eyes. But when they walked nearly a mile with her, she brought them to an old house where they could hear the sounds of puppies crying out to their mother. 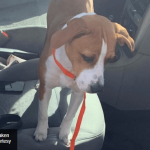 Edina was so upset by the mistreatment of this poor animal, so she bravely knocked on the owners door to ask them if they could take this dog who clearly wasn’t wanted. 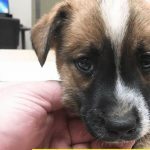 The man shockingly revealed that he had plans to abandon this dog and her remaining 2 puppies, 3 of which who had passed. To their amazement the mean man’s wife broke through the door, telling Edina and Caki that she’d secretly been feeding the dogs behind her husband’s back and begged for them to take the animals to a safer place. Currently, Edina and Caki are looking for a home(s) for this sweet dog and her two pups, the same dog who lovingly wagged her tail at the coldhearted man who wanted nothing to do with her. 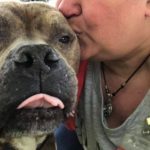 If you’d like to help, please click on their link (harmonyfund.org) to learn more about ways to help this poor dog in need. 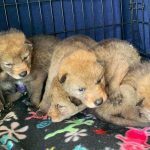 That is sad these owners should go to jail did this to her and puppies.She is cute and her puppies I am happy this rescued this beautiful dog and her babies she is a hero and have a heart.I hope they get a wonderful home I would update special this story.